With over 7,000 different kinds of certificate- and degree-granting colleges in the United States, new and returning students have a lot of options when it comes to finding a postsecondary fit that is right for them—especially as some institutions and programs are achieving wildly better outcomes for their students than others. That is why leaders from across sectors—school districts, charter networks, institutions, and the business community alike—are using data as a powerful tool for helping students find and graduate from institutions that are most likely to equip them with the skills they need to succeed in today’s economy. 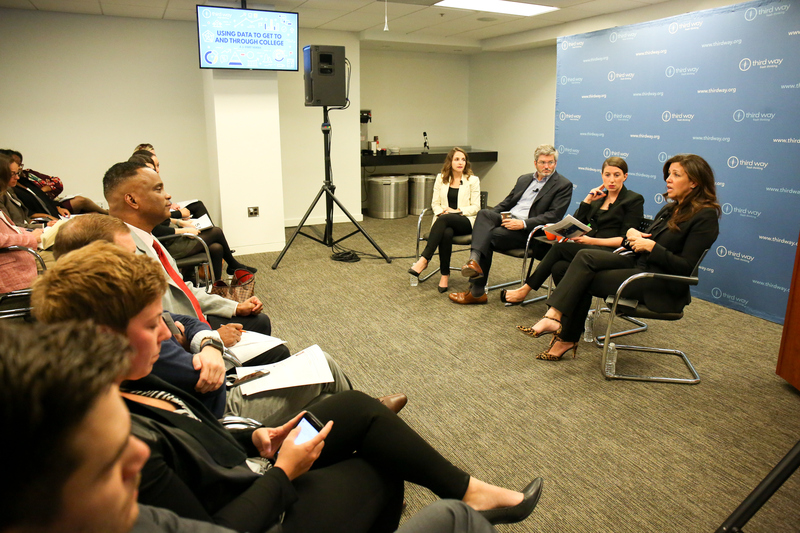 Third Way hosted the first event of a three-part event series where they explored the opportunities and limitations of using data about student outcomes to help get more people to and through college. The first event featured a conversation between Richard Barth, CEO of the KIPP Foundation, Erin Bibo, Deputy Chief of College and Career Education at District of Columbia Public Schools (DCPS), and Cheryl Oldham, Senior Vice President of Education and Workforce at the U.S. Chamber of Commerce Foundation. Erin highlighted the work of DCPS by mentioning that their focus is “all around the concept of making smart college choices...” including looking at data to drill down granularly to how well DCPS students performed in colleges. She added that, “the [DCPS] data sometimes aligned with the national trends, but a lot of times it didn’t,” emphasizing the benefit of getting data as granular as possible. Asked what metrics of data are the most important to know before students decide what school to go to, Cheryl shared an anecdotal story about a first generation college goer using the Chamber’s Launch My Career Tool and playing around on it. “[She] was passionate about music and wanted to be a music major, which was fantastic. But she started looking around and looking at various programs and realized that the outcomes for those particular programs weren’t going to give her, a lot of success in terms of income.” That tool eventually … helped that student rethink of becoming a business major minor in music on the side—highlighting the need to more students with earnings data as a powerful tool for selecting a program that will bring greater success post-college. In addition to earnings data, Erin and Richard also added that graduation rate, Pell graduation rate, average financial aid gap, and demographics are also important metrics students should consider when selecting a school. The panelists agreed that data is part of the education eco-system. Students are investing a lot of time and money in their education based on very little data. All the states have program level data and are choosing not to make it public. Currently the system only measures first-time, full-time, but only measuring first-time, full-time students is not comprehensive enough because it misses so much of the denominator. Follow-up conversations in this series will explore how institutions are using data to help students who are already enrolled cross the finish line and how data can be used to best connect graduates with workforce needs. The tools we will discuss in our next event are crucial, as according to federal data, only around six in ten first time, full time students who start college are actually finishing.